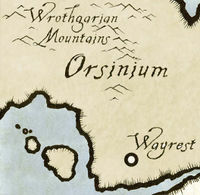 Orsinium (which literally translates to "Orc-Town" in Aldmeris) is the city of the Orsimer and the provincial seat of the region of Wrothgar, which came to be known as the Orsinium Area in the late Third Era. It has been sacked and rebuilt many times over the centuries, as the Orcs are often at odds with their Breton and Redguard neighbors. 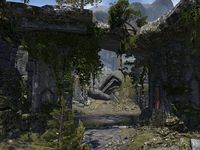 Orsinium was first built in High Rock, straddling the boundary between western Wrothgar and Rivenspire. 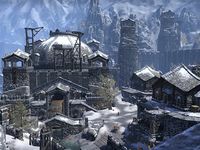 In the mid-Second Era, the city was relocated to eastern Wrothgar. 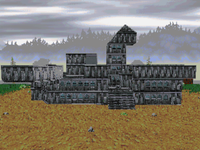 In 3E 399, it was relocated again to a site between Wayrest, Menevia, and the Wrothgarian Mountains. 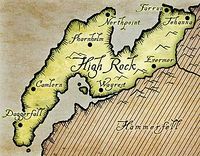 By 4E 201, Orsinium had been moved a third time, further south to an area between Hammerfell and Skyrim. This page was last modified on 9 November 2018, at 12:33.